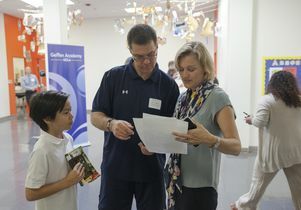 Head of School Sibyll Carnochan Catalan helps a student and teacher on the first day of school at the Geffen Academy at UCLA. Geffen Academy at UCLA’s inaugural class of sixth, seventh and ninth graders — a diverse group of students from 31 different cities around greater Los Angeles — climbed the steps Sept. 5 as the new school kicked off its first new school year. 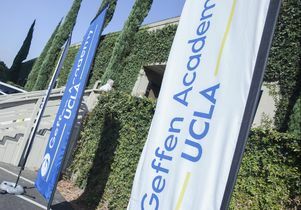 Arriving families were flanked by two dozen festive banners that declared “Welcome, Bruins,” “We are Geffen Academy,” and celebrated the classes of 2021, 2023 and 2024. Before lessons began, students found their lockers, scooped up their choice of novels from a library table for the daily reading period, and gathered with friends made during the school’s summer social activities. 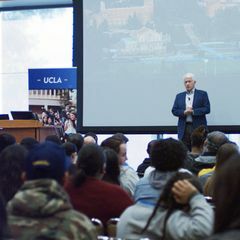 Geffen Academy at UCLA is a university-affiliated, tuition-based school with a public mission to support and improve secondary education, working toward full enrollment in grades 6–12 in 2020. The students came to Westwood from 61 ZIP codes throughout the greater Los Angeles area, including Inglewood, Santa Monica, Hawthorne, Beverly Hills, Van Nuys, Pasadena and Palmdale. This year, a third of the accepted students come from families working at UCLA, split nearly evenly between staff and faculty families; 70 percent are children from the broader community. Geffen Academy is uniquely positioned between public and private school traditions, with the freedom to develop a fully research-based curriculum aimed at participating in the national conversation about modern education. The first year’s tuition is set at $29,500, and need-based tuition assistance ensures economic diversity by helping roughly 30 percent of the families. The school was formed thanks to a generous founding gift of $100 million by donor David Geffen. 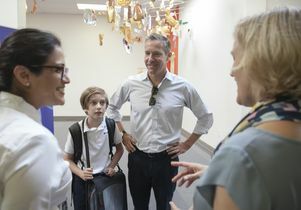 After dropping their 11-year-old son off for his first day of sixth grade, Kal Raustiala and Lara Stemple, who work at the UCLA School of Law, shared how satisfied they were with the new school’s faculty and goals. 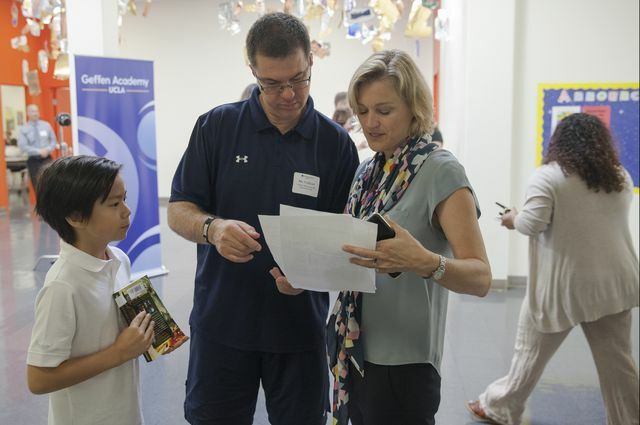 Parent and UCLA professor Kal Raustiala with his son, sixth-grader Clark, speak with Dean of Students Radhika Khandelwal and Head of School Sibyll Carnochan Catalan. The Geffen Academy faculty have designed the curriculum to provide students with a challenging academic environment, while also giving them the flexibility to discover their strengths and passions by exposing them to diverse new ideas. The school’s I-Track program offers students classes with opportunities for guided, independent research and creative endeavors at every grade level, giving them the skills and time to pursue their burgeoning interests in a way that teaches them to connect their own ideas with the world outside of school. The science curriculum will rotate students through a trimester of biology, chemistry and physics each year, so that advances from each one will build their strengths in the others. The faculty includes UCLA doctorates who taught at the university and teachers from prestigious public and private Los Angeles-area, college-prep schools. A focus on health and wellness, based on the latest research in the science of adolescence, will teach students to care for themselves by getting enough sleep, spending time and meals with their friends and loved ones, exploring their passions and learning to socialize with peers. All meals and snacks are included in tuition, and classes do not begin until 9 a.m. to encourage students to get the morning sleep that adolescent brains need. The school day lasts until 4:20 p.m. — except on Fridays when it ends at 3:10 p.m. — with an emphasis on completing most work at school so that students have time to develop their own interests and enjoy time with friends and family. Doors are open from 7:30 a.m. to 6 p.m. to provide a welcoming environment that accommodates parents’ work schedules. Geffen Academy’s pioneering first students explored their new home on Sept. 5 in the 25,000-square-foot Kinross South building, a brightly painted temporary space immediately adjacent to the school’s permanent home in UCLA’s Kinross building, which is scheduled to open in Fall 2018. Located near the corner of Westwood and Wilshire boulevards, the school’s partnership with and proximity to UCLA offers students and faculty a connection to extraordinary physical and academic resources, with unique possibilities for learning, recreation and community service. Geffen Academy is separate from the UCLA Lab School and students must apply independently to both schools. Likewise, admission to Geffen Academy has no bearing on admission to UCLA. While the Geffen Academy at UCLA is designed in part to attract and retain the best faculty and staff by offering those with children a quality, cutting-edge education option close to campus, the school also aims to serve an economically and geographically diverse population, with at least half the students mandated to come from the greater Los Angeles community. To support this mission, the school funds a robust tuition-assistance program and all fees are included in tuition, with no extra costs for food, sports supplies or field trips. Prospective students for Fall 2018 can submit applications to join grades six through 10 now through Jan. 8, with guaranteed interviews for students who apply by Nov. 17. Families have already fully booked three planned information sessions at UCLA this fall. UCLA staff are invited to a Staff Assembly Learn-at-Lunch information session on Thursday, Sept. 28. Two girls enjoying the first day of school ever at the Geffen Academy at UCLA. 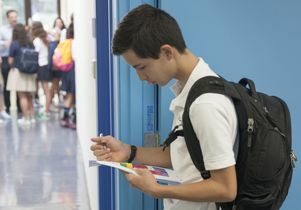 A boy walks down a hall on the first day of school at the Geffen Academy at UCLA. Signs in front of Geffen Academy at UCLA on the first day of school.